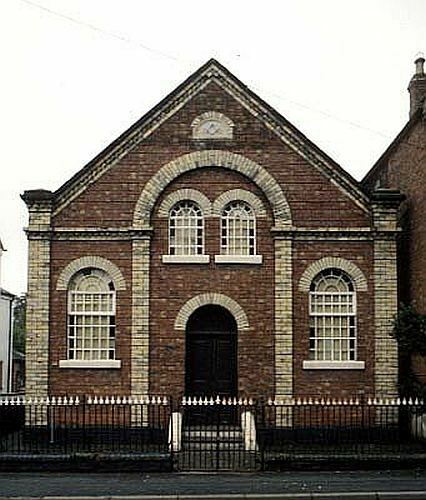 The first Primitive Methodist Chapel was built in Stafford Road in 1830, q.v. It was a plain brick building with a doorway and two round-headed windows in the gable end facing the street. It was replaced by this new chapel (in the photograph) built in Wellington Road in 1876. The foundation stones were laid on Monday the 15th of May and the chapel opened on Sunday 31st December 1876. The chapel was closed in the late 1920s when the Primitives joined with the Wesleyan Methodists in Avenue Road. The building is now the Masonic Hall.